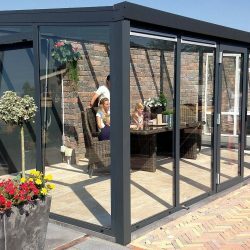 A complete garden room offers a great deal of combined benefits. 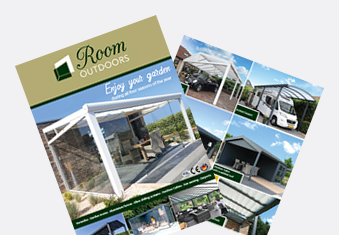 We have three standard varieties of garden rooms in diverse sizes. 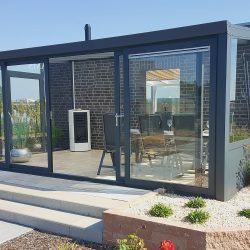 A garden room with glass sliding doors (including two gables and glass), a garden room with double doors (including two aluminium walls and glass) and a garden room with 4-pieces sliding door (including two aluminium walls and glass). 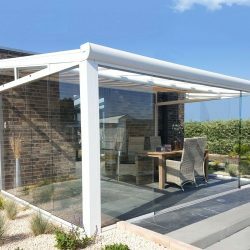 The garden rooms are available in the following colour ranges of White (RAL 9016), Cream white (RAL 9001), Anthracit with texture (RAL 7016) or Grey texture (RAL 9007). These complete package varities offers you combined benefits in abundance!